by Richard H. Gentzler Jr, Melanie Gordon, and others. (Craig Kennet Miller). Discipleship Resources, 2014. Recognizing that today’s congregations consist of six generations at various transitions in their lives, the General Board of Discipleship of the United Methodist Church staff gathered a team of professionals to write multiple articles examining issues and trends. Charts are included to give an overview of the generations and what has shaped values and beliefs. There are thought-provoking pieces concerning children, the poor, and legacy building. Considering the impact of technology, readers are encouraged to humanize technology, embracing it with the faith perspective. How we accept multi-economic levels and multi-cultural realities in our congregations will be important for the future. A new look at families, singles, and aging can offer opportunities for the church to be innovative and intergenerational. Inclusion of stories and observations from young adults gives fresh perspective. 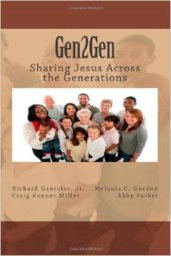 Suggestions and strategies are offered to help congregations transition to intergenerational thinking. Recommended resources are listed at the end.